Last week, New Horizons woke up from its longest electronic hibernation period to date — 89 days. And over the next 10 days, the New Horizons team will celebrate a trio of milestones on the spacecraft’s long journey to explore Pluto in 2015. The team roused New Horizons from hibernation mainly to re-point the spacecraft’s antenna, adjusting to the changing position of Earth around the Sun. The operations team is also carrying out navigation-ranging tests that mimic operations at Pluto, as well as conducting additional tracking, downlinking data from the student dust counter instrument, installing and testing bug-fix software for the SWAP solar wind plasma instrument, and uploading the spacecraft flight plan for the next several months. These activities will be complete by June 2; the next day, New Horizons will re-enter electronic hibernation for another 91 days. It will awaken for its annual checkout on Sept. 2. New Horizons reaches the first milestone just before going back into hibernation. On June 2, the spacecraft will be 10 Astronomical Units (au) from the Sun. One AU is the distance from the Earth to the Sun, about 93 million miles (or 149 million kilometers). New Horizons will be 930 million miles, or just about 1.5 billion kilometers from the Sun. On June 3, the mission team will celebrate the spacecraft’s 866th day in flight – or one-quarter of its 3,463-day (9.5-year) journey to Pluto. 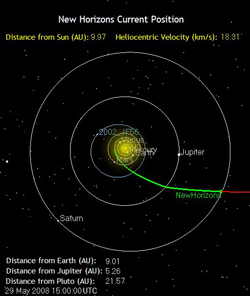 New Horizons will pass its halfway mark to Pluto in another 866 days, on Oct. 17, 2010. Most notably, however, on Sunday, June 8, the spacecraft will cross the orbit of Saturn, though Saturn itself is nowhere near the course New Horizons is following to Pluto. “This milestone is significant because the last time any spacecraft journeyed beyond Saturn was 27 years ago, in August 1981, when Voyager 2 passed Saturn on its way to encounters with Uranus and Neptune later in the 1980s,” says New Horizons Principal Investigator Alan Stern. After New Horizons passes the distance where NASA’s Cassini orbiter is operating at Saturn, only two spacecraft will be operating farther out than the Pluto-bound probe. These are NASA’s Voyagers 1 and 2, which are at the edge of the Sun’s heliosphere approximately 100 AU away. 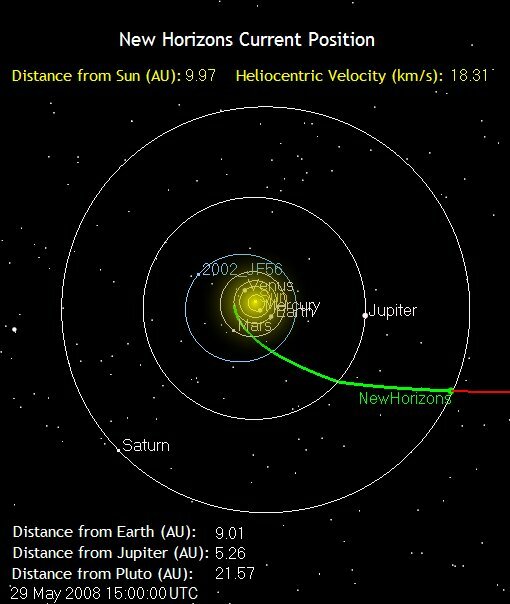 To continue tracking New Horizons on its voyage across the solar system toward Pluto and the frontier worlds of the Kuiper Belt, check in at http://pluto.jhuapl.edu/Mission/Where-is-New-Horizons/index.php.